Situated on Fiji’s main island at Viti Levu’s most Northern point – 2 1/4 hours drive from Nadi Airport, Wananavu Beach Resort accommodation in Fiji offers you the feel of an island paradise with the convenience of the mainland. 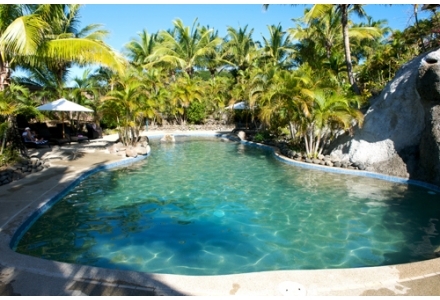 Wananavu Beach Resort has 31 deluxe bures situated on the palm-fringed ocean or amongst the lush tropical gardens. The spectacular reef and sunset scenes from the bures and restaurant bar complex are unparalleled. There’s always something for everyone; diving, cultural activities, picnics to secluded beaches, village tours, snorkelling, fishing, kayaking or just lying by the pool with a book and a cocktail. There are no phones, radios or tv’s in the bures, giving you the chance to experience a peaceful slice of paradise. Each bure and villa offers air-conditioning and ceiling fans or can be naturally cooled by the sea breezes. Every bure is ocean or garden facing or overlooking the beach so you can be assured of unforgettably stunning views.